Read my Bright Red Lips – Winner! Thank you to everyone who entered the Read my Bright Red Lips contest. This was my first blog contest and what a success! I gathered so many great suggestions for red lipstick. The most suggested color is Mac’s Ruby Woo. And now the moment you have been waiting for…our randomly chosen winner! Combining the Twitter and Blog entries that makes our winner…ohstac! Congratulations! Thanks again for all your entries! I will be running another contest soon so stay tuned! Read my Bright Red Lips – Contest! Lately I have been jonesing for a change. A few weeks ago a died my hair a bright color of red – quite a change for normally conservative me. While my neutral lip glosses and coral lipsticks are comfortable and pretty, I need something that really pops with my new hair. After seeing a slew of celebrities don bright red lips at Fashion Week I was inspired. Being as I don’t own any red lipstick, I need your help! I am looking for quality, long lasting lip color. What is your favorite brand/color of red lipstick? Leave a comment with your answer. 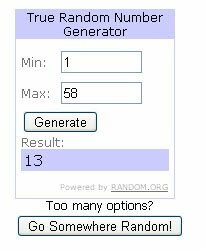 I will randomly choose one response to win a $10 Ulta gift card! Post this on Twitter for a bonus entry! Entries are now closed! Congrats to our winner! Thank you everyone for entering. Click here to see a round up of suggestions.